We have recently achieved some significant results in our campaign against the Arad-made water meters being installed by Southern Water. 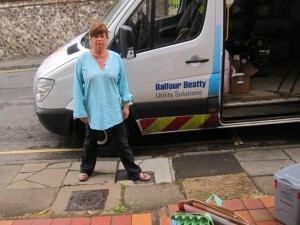 A number of Lewes residents have refused to allow Southern Water to install the Arad meters, and have insisted on an alternative product. We know of at least 10 households, and there could well be many more, since people wouldn’t necessarily inform us. This has prompted a full and positive feature in the Sussex Express, the Lewes local newspaper, last Friday (“Call for a boycott on Israeli-made meters”). You can see a scan of the article here. The MP for Lewes, Norman Baker, has issued a strongly-worded message of support, and has written to the CEO of Southern Water asking for the contract with Arad Technologies to be re-assessed. You can read the full text of Norman Baker’s message here. Our campaign has also attracted the attention of the Israeli media. Have a look at the article that appeared in Ha’aretz last week. The article shows that, although the actual number of refusals remains small, the impact has been considerable.